“Priyanka earned much more than Mary Kom did in her entire career” the social media seem to scream. Well like Chinmayee Sumeet pointed each did their jobs and the disparity only mirrors our attitude towards the professions and not the competency of the professionals. Again as Priyanka herself pointed out, the battle that Mary Kom lead, and is still fighting is so enormous that all monetary translations would be pittance in comparison. What Sania did to Tennis, Saina to Badminton, May did to Boxing. Major Glass ceilings are broken here. It is amazing the kind of achievement they have done. 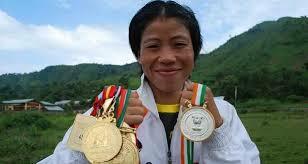 Mary Kom more so for knowingly or inadvertently we tend to forget north-east unless talking of exotic ism. Coming to the movie I have not seen it thought I do intend to. It has brought awareness of a large section of girls who are into boxing. It has also made the “intelligentsia”, the global Indian acknowledge that there is a vast population of Indians who think beyond cricket and Television. The Deccan Chronicle actually carried an article on a lesser known “boxing school” for girls in Telangana which has been around for about half a decade. Mary Kom has also made the middle class supermom, who wants her child to be “princess-ballerina- astronaut” accept that the ballerina can be replaced by boxer though a little reluctant it has become acceptable. For those of us the disparity is a problem, instead of clucking our indignation, or feeling very righteously upset we could do something proactive..
Maybe donate at least one ticket money to the Mary Kom Academy? Next PostNext Revenge Getting Even—a different approach to anger.